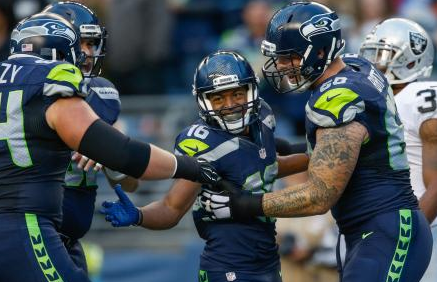 The Seahawks’ second and third offenses ran it down the Raiders’ throats, gaining 224 yards. Thomas Rawls ran well, gaining 87 yards on 11 runs. Was it too little too late? Or did he show enough to make Carroll consider keeping him if the Hawks put Robert Turbin (high ankle sprain) on IR? If the Seahawks are thinking short-term IR for Turbin, here are the rules: A team can place only one player on the list; the player must have a six-week injury; and the IR move can’t be made until Tuesday. Carroll said the nickel corner job is “very competitive,” with Will Blackmon, Marcus Burley and Tye Smith competing. One consideration: Burley and Smith are cheaper and younger (i.e., the club controls them beyond 2015). Mohammed Seisay’s tough preseason continued. Freshly returned from a groin njury, he suffered a dislocated shoulder in the fourth quarter. The Hawks were going to send a conditional 2016 sixth-round pick to Detroit for the cornerback, but now they probably can get away with waiving him and having him revert to IR without giving up the pick. Jesse Williams had a sack and Carroll said he had “a marvelous showing, a terrific summer. We are really proud of him.” If the 2013 fifth-rounder doesn’t make the team, there is speculation that the Hawks could put him on the non-football injury list — basically stashing him until next year.